Coppell TV Repair offers a REPAIR SERVICE for power supply board MEGMEET MLT169A or MEGMEET MLT169B as shown on the picture. REPAIR SERVICE means that you need to send us your malfunctioning board that we will attempt to service, test and return to you. Typical failure symptoms of a failed MLT169A or MLT169B include no red LED at the back of the TV in standby mode, quick switch from red to green/blue upon powering on and then returning back to red standby or tv powering on and staying on, but showing nothing on the display (remaining dark). Any of those may also be caused by another bad board in the tv, of course, but are usually a good indication for a failed power supply board. 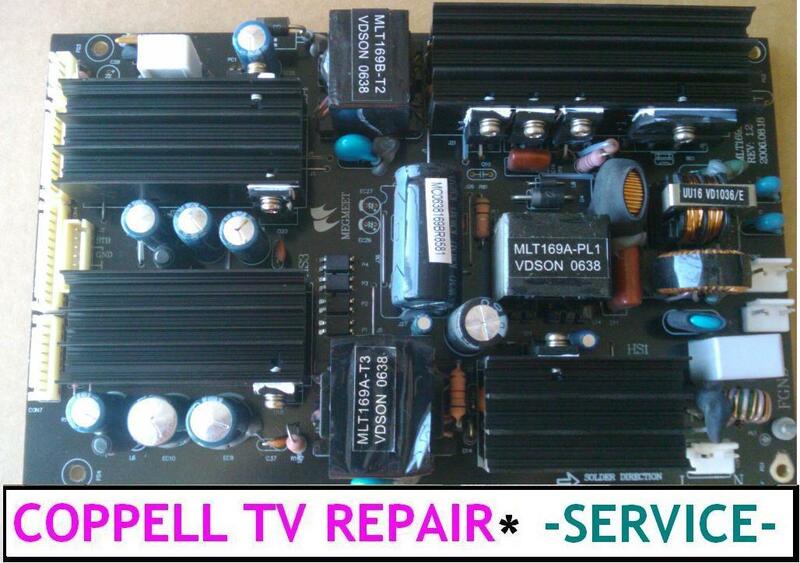 If a board arrives and is determined to be functional we charge up to $20 for diagnostic fee.